There has been rising concern over teenagers sending text messages while driving, even getting the attention of Oprah Winfrey. Ms. Winfrey has gotten so involved with the cause that she has launched a program called “Oprah’s No Phone Zone” directed at educating teenagers about the dangers of multi-tasking while driving. The problem is that she and others may be directing their efforts not at the worst offenders. According to PC Mag, The Pew Internet & American Life Project conducted a study of 2,252 adults in the United States over the past two months, 1,917 of those owned cell phones, and of those 1,189 said they used text messaging. It’s the ones who use text messaging that raise the concerns as 47 percent of them said they have used text messaging while driving, which compares to 34 percent of teenagers who said they did the same in a study conduced by the same group in Sept. 2009. The odds drop with age as 59 percent of Millennials have texted while driving, 50 percent of Gen Xers (ages 34 to 45) and 29 percent of Baby Boomers (ages 46 to 64). 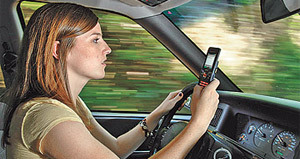 Of the entire group, 49 percent have been in a car with someone who read or sent texts. 75 percent of Millennials, 59 percent for Gen Xers, 37 percent of Baby Boomers, and 18 percent of those over the age of 65. Breaking it down by race, 56 percent of black adults, 58 percent of Hispanic adults and 46 percent of white adults have been passengers of texting drivers. And, by the way, 17 percent of respondents have said they have walked into someone while distracted by texting, so it isn’t just happening in cars. Perhaps it’s time we all put down the phones for a while? What say you? Have you ever read or sent texts while driving? Ever walked into someone while doing the same?